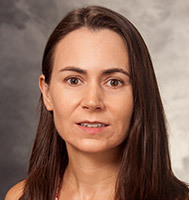 Dr. Kristine Matson is an Associate Professor in the Division of Infectious Diseases at the University of Wisconsin-Madison. She has been board certified in infectious diseases since 2007, and additionally received a Certificate of Knowledge in Tropical Medicine in 2008. Dr. Matson has many years of experience as a travel medicine provider and tropical infectious disease specialist. She also has extensive personal experience traveling and working in countries around the world. As part of her medical training, she participated in infectious disease electives at Siriraj Hospital in Bangkok, Thailand, and Mulago Hospital in Kampala, Uganda. She additionally studied parasitology in Iquitos, Peru, and has also volunteered with an HIV care and treatment program in Addis Ababa, Ethiopia. She also has many years of research experience related to tropical infectious diseases. From 2004-2012, she worked with research collaborators from the International Centre for Diarrheal Disease Research, Bangladesh (ICDDR,b) in Dhaka, Bangladesh, on projects related to amebiasis. She also spent several months in Haydom, Tanzania, helping to develop a research site to study infectious etiologies of childhood diarrhea and risk factors for malnutrition.